At this point, the idea of a group attempting to manipulate audience scores on Rotten Tomatoes is hardly a new one. In the last year, blockbusters such as Star Wars: The Last Jedi and Black Panther have each fallen victim at time to brigading, the act of mobilizing large online crowds to simultaneously downvote a film in an effort to hurt its rating. Rotten Tomatoes even made a statement about the attempted manipulation of Black Panther’s score. The thing is, though, that “manipulation” can go both ways. 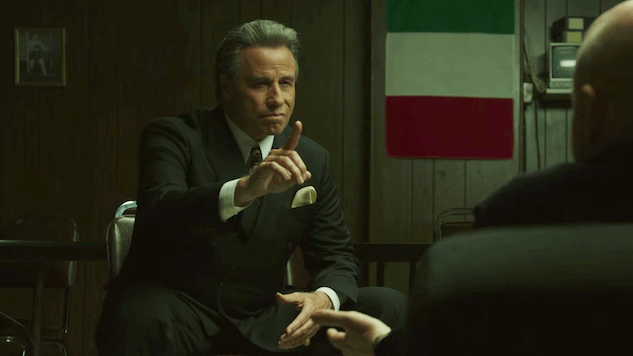 And as one savvy reddit user noticed in a post published on Tuesday morning, there seems to be some very strange stuff going on in the user ratings for the John Travolta gangster film Gotti, all of which point to some more possible manipulation at play. Gotti, which made headlines when it received financing and distribution from subscription service MoviePass, was absolutely savaged by critics, and can currently boast the rare “perfect 0%” RT score. Its Audience Score, on the other hand, is a robust, fairly respectable 76%. But it’s not the overall score that stood out, it was the number of ratings. After opening on just 500 screens this weekend and making a pitiful $1.7 million at the box office (good for 11th place this weekend), Gotti has somehow garnered almost 7,000 user reviews. Compare that with The Incredibles 2, which has earned only 7,600 user reviews in the same amount of time, despite making an astounding 105 TIMES MORE than Gotti at the box office in the same one-weekend period, and it immediately becomes clear that Gotti’s number makes no sense. The disparity seems to have first been noticed by Screen Junkies’ Dan Murrell, who noted that the audience score was being used by a Twitter marketing campaign for the film that mocked the critical drubbing and told viewers to trust the audience score instead. A flood of new accounts that have only reviewed one film? Nope, nothing suspicious about that. And if you were wondering “Why American Animals?” Consider the one thing that the two films have in common: MoviePass. American Animals was the first film that the company took a stake in, seemingly desperate to find more income sources to prop up the “unlimited tickets” business model that MoviePass operates under. Like Gotti, it hasn’t exactly set the box offices aflame. It seems safe to say that something is probably rotten here, and it ain’t a tomato. But what would we know? We’re just “trolls behind keyboards,” according to the Gotti marketing campaign.